When a sequel was announced for last year’s small Nintendo eShop release, BOXBOY!, I was ecstatic. BOXBOY! was one of 2015’s hidden gems, and it is great that this series is getting a continuation. However, the question is does BOXBOXBOY! live up to its predecessor? The answer is yes and no. Allow me to elaborate. BOXBOXBOY! has added a new feature that fundamentally alters how you go about completing levels. Rather than just having one set of boxes you can now have two, and that means that you will often have to use both sets of boxes in tandem to solve puzzles – either by using them to make huge paths, to hit multiple switches and so forth. This changes how you think about tackling each stage. 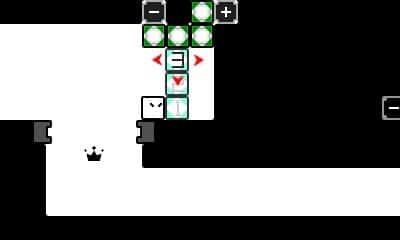 Story wise, the game starts off exactly where BOXBOY! left off, with Qbby and Qucy resting after having saved the world. However, a mysterious new threat appears and awakens Qbby. This sets Qbby off through various levels, once again trying to save everyone. It continues on so closely that if you have a complete BOXBOY! save on your Nintendo 3DS already, your data will be automatically imported so you can keep any costumes you obtained. Each world has a specific mechanic that it focuses on, such as magnets and cranes, and each level has crowns for you to collect to be rewarded with bonuses. However, the problem with this is that outside the two box mechanic, there’s very little else new introduced into the game. The elements in each world were all utilised in the original BOXBOY! and, in some parts, utilised better in the original due to the game now requiring that you use two sets of blocks to finish. That’s not to say the puzzles aren’t fun or even challenging when you get towards the end of the game, there’s just has an element of “been there, done that” if you played BOXBOY!. That’s not necessarily a bad thing, as BOXBOY! is fantastic, it just results in a wish that there was more new to this. It’s still a fantastic game, though. The mechanics really make your brain whir. You have to stop and think “how do I complete this stage without going over the block limit?”. It’s very fun and incredibly rewarding to conquer each world, and there are a lot of levels to play including a special challenge world that has stages based on clothing. There are also various items you can purchase with the currency you collect in the game, such as small comics featuring Qbby. Graphically it matches the aesthetic of the previous game. It’s not going to win any awards for being the best looking game, but the graphics cfit the game’s concept. They’re basic, but stylish. Colour is seldom used except in the post-game and with a couple of costumes. Unfortunately there is no stereoscopic 3D in the game, and there were a couple of times that it felt like the game had a frame-rate hiccup. But overall, it’s a stylish minimalistic game which is nice on the eyes. BOXBOXBOY!‘s sound is rather decent. The music is soft enough to allow you to think, and catchy enough to stick in your head when you are not playing the game. The rest of the sounds are just general. As with its predecessor, you can purchase music with the in-game currency in order to listen to them in a Sound Test. BOXBOXBOY! is a decent successor to the original. While it doesn’t bring too much new to the fold, it’s still a joy to play and can be a real head-scratcher. It’s worth playing if you’re new to the series, and, if you enjoyed BOXBOY!, why haven’t you already started stacking?